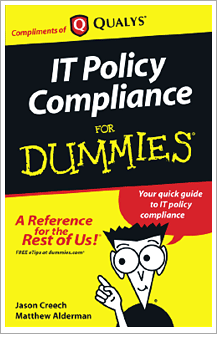 Just released – "Dummies Guide to IT Policy Compliance" in conjunction with publisher John Wiley & Sons. This handbook provides a quick guide to understanding IT policy compliance in plain English. It surveys the best steps for preparing your organization’s IT operations to comply with laws and regulations – and how to prove compliance to an auditor. In this book you will discover what IT policy compliance is all about, how laws and regulations govern compliance, ten best practices and how automation can ease compliance and save money. This book is co-authored by Qualys&apos; Jason Creech and Matt Alderman. To download a free copy, visit http://www.qualys.com/forms/ebook/itpcfordummies/.